In the heart of one of the most beautiful villages in France, Paragliding Experience welcomes you in Gourdon. You'll enjoy an exceptional view on 80km of coastline between Nice and Théoule sur Mer. 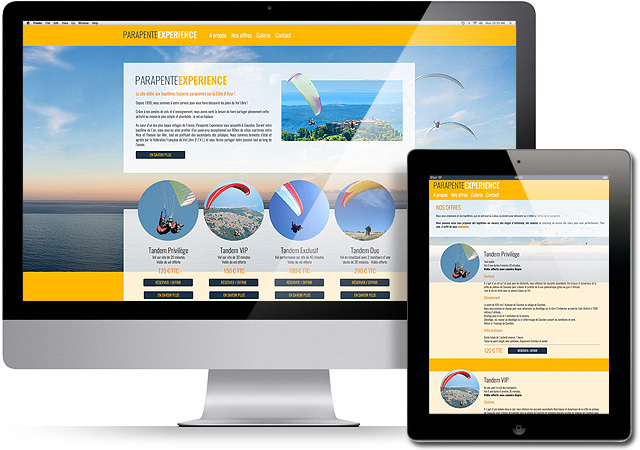 Paragliding experience, the website dedicated to baptisms seater paragliders on the French Riviera! A new site responsive (which fits on all connected devices: smartphone, tablet computer, etc ...) designed entirely from our house CMS: CaMyks. A beautiful image gallery, contact form complete this site.